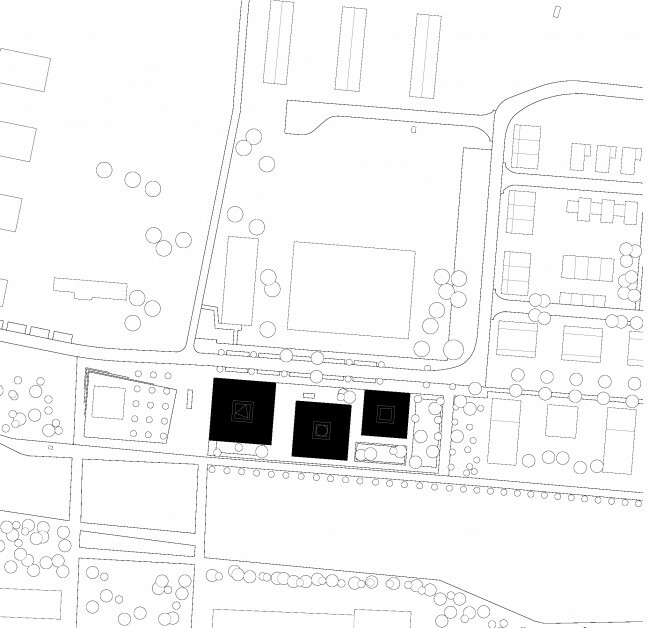 Large open stretches, wide green axes, low-density built-up areas—east of the center of Würzburg, the Hubland grounds, an area shaped by the 2018 State Garden Show, offers open space for residents, students, and the future employees of the local doctors’ center. By combining residential with commercial and service-business uses, AllesWirdGut’s three-building ensemble strengthens the infrastructure in the development area and provides for a more mixed neighborhood. 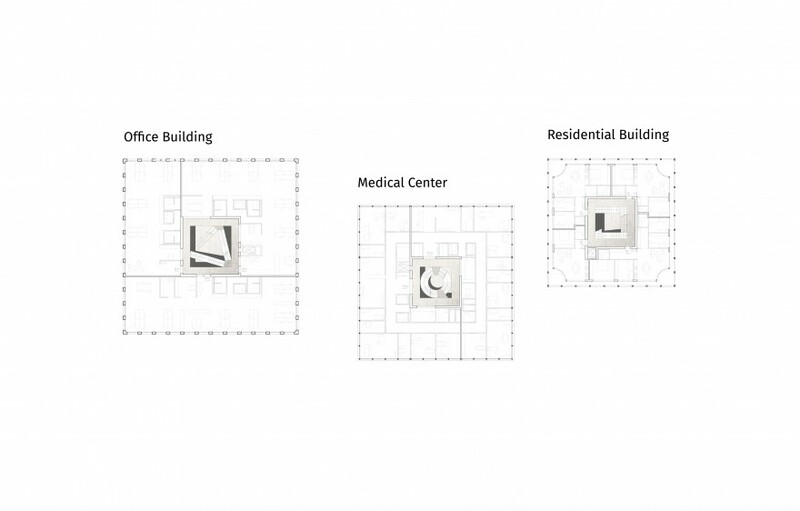 Different spatial programs inform cubic buildings of varied dimensions, which are also distinguished by footprint and number of floors. On the ground floor level, the buildings consistently follow the idea of showcasing the service functions. Arched arcades frame the urban space and lead from public to semi-public areas. Set off against them, the more private areas are situated on the upper floors and accessed through an open staircase. 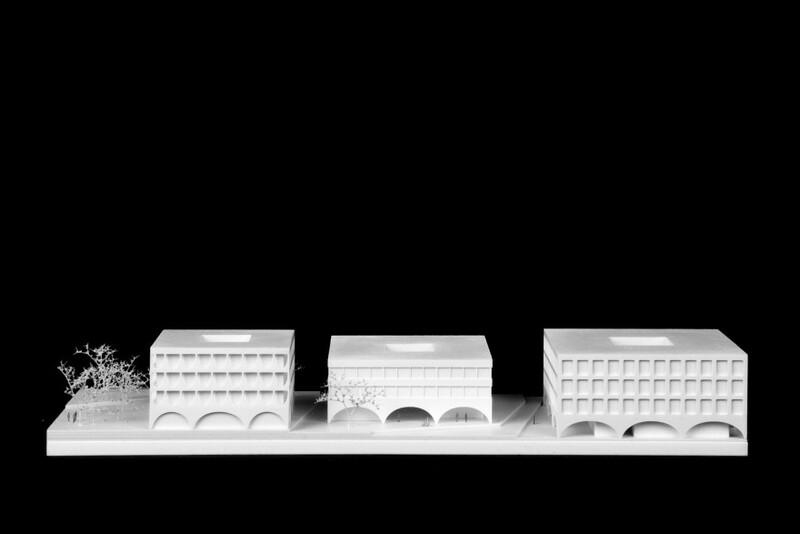 The various functions of the architectural triad are also clearly readable in the façade designs: while the flexibility of the office space is expressed through a strict grid with generous glazed apertures, the doctors’ center is set back from the frontage and has a strip façade which, while securing sufficient daylighting, also provides for a maximum of privacy. The residential structure is characterized by private outdoor spaces wrapped around the building as rows of balconies. 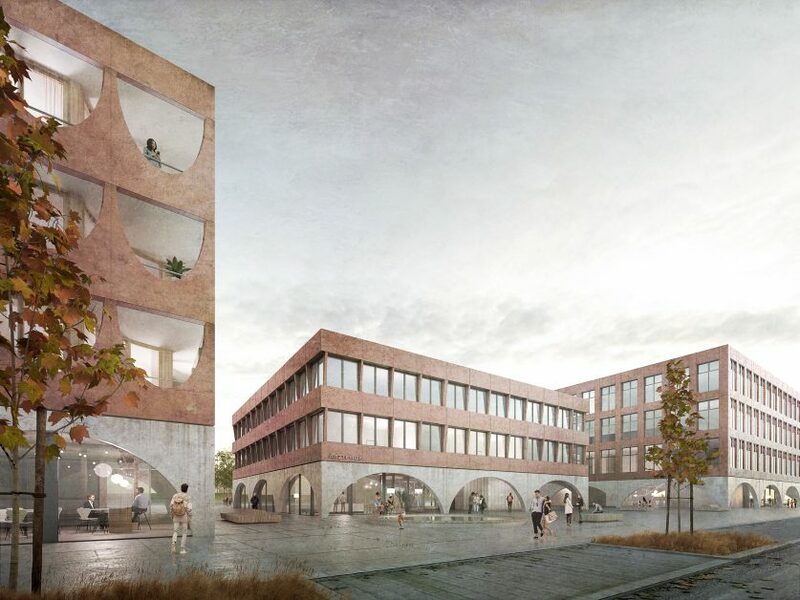 Aesthetically, the ensemble is unified by the red concrete used in the building fronts, which also translates to the surrounding open spaces it accentuates. Referencing the red Main sandstone that is typical of the region, the connective function of the ensemble is thus expressed as a widely visible landmark: one hub, three functions, numerous possibilities.